tundra in Hudson Bay near Churchill, Manitoba. Day 7 of our two week stay in Churchill - half way through! So far it's been extremely frustrating with only one really successful day with the Polar Bears. On the positive side, we have met some very interesting and "funny" people, the last group of whom left late last night or early this morning (whenever the train finally left Churchill). We turned up for breakfast at our usual time this morning and what should be waiting for us on the table but an arctic hare sitting proudly on a box of cornflakes! These guys obviously had a lot of time to kill (courtesy of VIA Rail). The hare was masterfully crafted from several white marshmallows held together by toothpicks while intricate details such as eyes and nose had been artfully drawn on. It was nicely done! One thing for sure you meet a lot of fun folk at a bed and breakfast especially when you stay a week or more. On another positive note, we looked out the window this morning and were greeted by the sight of white stuff - a nice covering of snow, although not deep it really freshened up the landscape! It's also getting very cold, so we assume that those bears will come out of hiding eventually. Day by day the pack ice is forming in Hudson Bay - it begins very gradually but as the days and nights become colder the process speeds up. Now there is a narrow shelf of thick ice fringing the coves and bays - the makings of a platform for the polar bears to reach their prey! We headed out and started driving our usual route, taking a few side roads as we went. It was looking a lot like yesterday - no life! 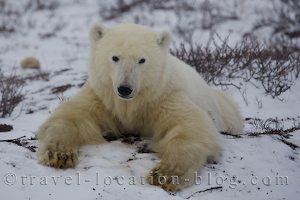 That was until we checked the same spot where we'd seen the polar bears the last time and .... there he was!! The young bear we'd seen was back at the same bush and digging at its roots!. As we approached he was a little spooked and ran from the bushes, but returned once we switched off the engine and watched him. We were only a matter of 10 metres from the bear and had a really clear view of him. A few other visitors arrived after about an hour but left after only 10 minutes. We'd nicknamed the polar bear Dopey since his personality seemed to fit the name! He was eating a long time but he eventually wandered over the road to lie down and we ended up spending over 5 hours with him. It was freezing cold as the wind had picked up, but we were determined to stay with him. At one stage a group of people on a photo workshop arrived in 4 vehicles - it was like how you see it on the movies with the FBI! As soon as the vehicles stopped (200 metres away) they all piled out and set up their tripods. Every inch that the bear moved, we heard the camera shutters firing but unfortunately for the group, Dopey had his back to them. He rolled around on his back a little, shifted position several times, stood up to stretch, and just looked plain cute! He was a great model for us and very co-operative! By 4:45pm it was getting pretty dark so we decided to pack it up for the night. We left Dopey in peace - hopefully he'd be back tomorrow to model for us.